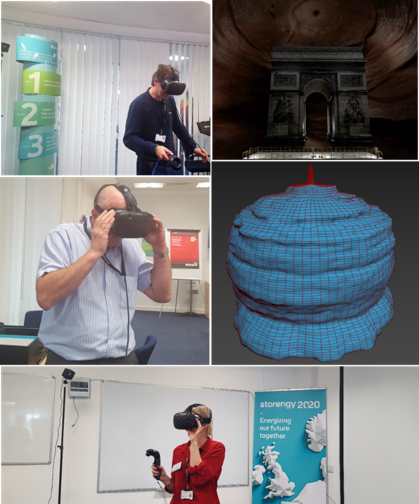 A member of Storengy UK staff succeeded in developing a new approach to the business combining innovation, customer’s experience and involving Virtual Reality. Thanks to this successful project, customers and staff can now visualise what a cavern really looks like and how big it actually is. The fully immersive computer simulated technology, was put into place to allow customers experience an environment they would not normally be confronted to. Before putting on the headset, the process started by gathering all the information from the sonar scanning of the cavern. As a salt cavern is completely dark inside, daylight system had to be created, and it was decided that all lighting would be generated by spotlights. To increase the realism and make the experience even more special, additional items such as platform, water pool, were put into place. The Arc de Triomphe was added in the cavern for people to visualise how big a salt cavern is. VR is currently used in a variety of industries for training purposes. For Storengy UK, safety is a priority. Thus, it could also be used for training staff on managing hazards, emergency planning or processes to demonstrate complex work orders or tasks. The company is looking forward to creating a 3D tour of the gas plant for stakeholders and customers to visit the gas plant and be more familiarised with our activities.